Celebrate Heritage Month with tales from Ottawa's past! 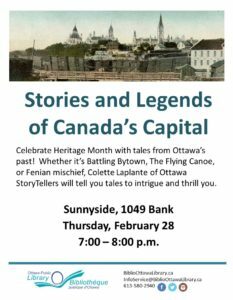 Whether it's Battling Bytown, The Flying Canoe, or Fenian mischief, Colette Laplante of Ottawa StoryTellers will tell you tales to intrigue and thrill you. Drop-in program.